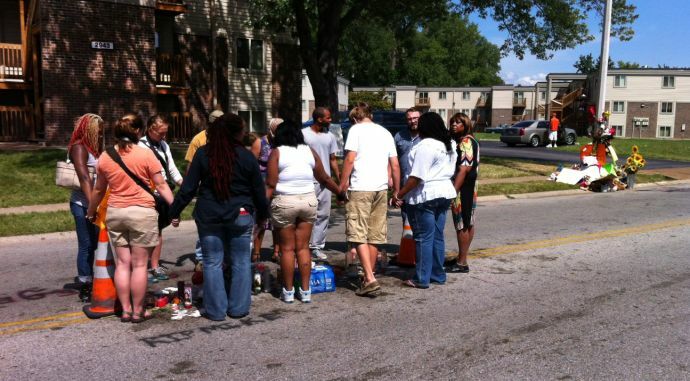 People hold hands and pray during an August vigil near the site where Michael Brown was killed in Ferguson, Mo. For more than 90 days — a length of time past expiration for some, not long enough for others—our community lives in suspense while suspicion grows. We await the decision of whether a grand jury will indict Darren Wilson, a white Ferguson police officer, for fatally shooting unarmed, 18-year-old Michael Brown on August 9. In anticipation, the Ferguson-Florissant School District and adjacent school districts plan to close schools when the grand jury releases its decision. According to reports, the Ferguson Police Department is stockpiling teargas, grenades and other weaponry to use in the event civil disorder follows a grand jury decision not to indict Wilson. Nearby law enforcement agencies are likewise preparing for civil unrest. These are unnerving indicators that law enforcement are preparing a response to civil disorder with violence. Certain circumstances lead to civil disorder. Stress and strain cause us to shout, and predicaments like Ferguson require remonstration. This is true not only in Ferguson; it’s true in every place where people are pained and protracted problems persist. A just society is to be judged by how well it treats the weakest, poorest and pained of its members. The church, not only society, must remain answerable to a similar critique. Our systems are malignant and myopic, able only to label or categorize. The cultural practice is to make caricatures of individuals based on assumptions, biases and stereotypes, rather than celebrating our divinely given personhood. The Rev. F. Willis Johnson. Photo courtesy of Johnson. In the days following this tragedy, our work has afforded the opportunity to listen to people across the spectrum: youth, corporate executives, educators, journalists, national leaders, even philanthropists. There is a shared heaviness of heart regarding the shooting death by police of yet another young, black person. However, few bear the burden of such heaviness more than a parent. After an unprofessional sigh and exclamation of, “Whoa,” I commented that it not wrong to feel. Under no pretense does anyone deserve to lose his or her life. Nor should he or she have his or her personhood ever discounted. Not feeling something is not human. Some have felt moved to respond. Others are immobilized by the weight of their emotions. Many profess their feelings of pain and angst publicly through protest. There are also those who lament privately. Each of these methods is a uniquely profound and necessary form of expression. For instance, prayer and protest are the voice of the unheard and unexamined. There is no one manner in which to think or act. People who are hurting need to be affirmed in their hurt; people who are angry need to be affirmed in their anger. This way of listening and hearing one another is called empathy, a core value of human relationship and community. The conversation highlights our inability at times to move or feel. Daily, we struggle to maintain efforts to coexist, understand, listen, trust or sustain hope in systems, leaders and practices. This is true whether in Ferguson, Missouri; our family; or our church. Such is the challenge of exercising “courageous compassion.” Courageous compassion is risk-taking… it is daring to care. Courageous compassion defies convention. Courageous compassion seeks equity and justice through ministering at the margins — demonstrating divine commitment. Respecting that decisions and actions may not produce the results many expect or want — hope is not lost. Justice is promised, and peace will be given. Peace may exist beyond our understanding, but is not beyond our grasp. Regardless of the outcomes we are called — for such a time as this — to be courageously compassionate towards all. 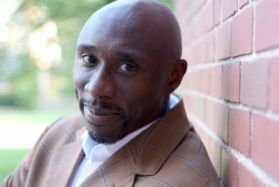 Johnson is pastor of Wellspring Church, a United Methodist congregation in Ferguson, Missouri.